Amazon has announced their latest Kindle device, the Amazon Kindle Touch, and as the name suggests there are no physical buttons on the Amazon Kindle Touch like the existing models. 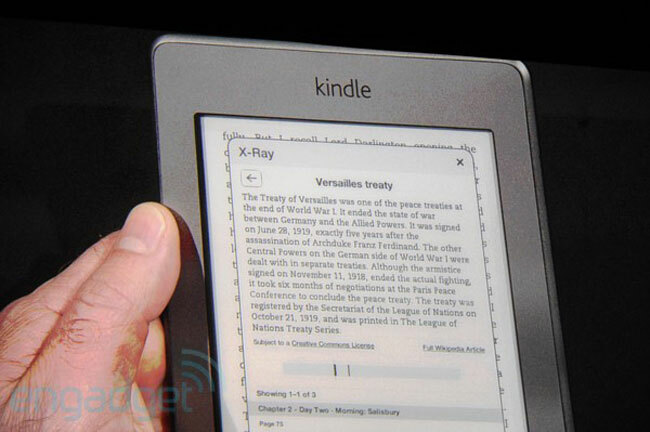 The Amazon Kindle Touch comes with a new feature called X-Ray, and what this does is show you information about the book you are reading from external sources like Wikipedia. Amazon will be offering the Kindle Touch in WiFi only and WiFi and 3G models, the 3G model will be available with lifetime wireless data in more than 100 countries for $50. The Amazon Kindle Touch will retail for $99 whilst the Amazon Kindle Touch 3G will retail for $149.